THE IEEE Australia & New Zealand Student Congress (ANZSCON) was held in Melbourne from 24‐26 November 2010. This inaugural event was designed to promote networking and interaction between IEEE student members from Australia and New Zealand. Distinguished guests included Joseph V. Lillie, IEEE Treasurer and Executive Committee member, and Gordon W. Day, IEEE President‐Elect for 2011. Lillie delivered the Keynote Address to the opening plenary session and both executives made significant contributions to the scheduled program. At the welcoming cocktail reception on Wednesday evening 24/11, we were pleased to welcome many delegates from interstate and overseas in a friendly and informal atmosphere. This set a positive mood that was maintained throughout the congress. The Congress opened the following morning at 9:25am. Attendances at that stage were recorded as 62 Students and 10 Guests. The official welcome was delivered by the presiding ANZSCON Chair and endorsed by the IEEE Victorian Section Vice‐Chair. We were then eased into the day’s business with a fun “icebreaker” session requiring delegates to build towers with drinking straws. After morning tea, Joe Lillie gave his Keynote Address on the subject “IEEE – For You and the World”. He was followed by two University presentations (Melbourne and RMIT respectively). In the afternoon, Darrel Chong from the IEEE Region 10 Student Activities Council described the impact that IEEE membership can have on the career of a young professional, based on his personal experiences. Later in the day there was another feature event, a “Three‐Minute Thesis” competition, won by John Quinn from Queensland. John was also runner‐up in the Poster competition. At the Congress dinner held that evening there were 96 in attendance. This number included many invited guests from Industry, Universities, and IEEE Victorian Section. During the evening two Students received awards from the IEEE Australia Council. On Day Two there were many interesting presentations, not least that of Dr Paulo De Souza of CSIRO ICT Centre in Hobart, who described his involvement in the NASA Mars Rover project. Later feedback showed that this was a particular favorite of the students. Gordon Day, IEEE President-Elect, and Amarnath Raja, IEEE Humanitarian Technology Coordinator, gave a joint presentation on the humanitarian issues currently being addressed by IEEE corporate strategies. Industry representative Terry Polkinghorn then spoke on the topic “Entrepreneurship – Networking for Success”. After lunch we split into three parallel sessions in a more informal environment. There was a Poster/ Project competition attracting fourteen (14) entrants, an Employers Forum with seven industry representatives, and a total of five breakout sessions. 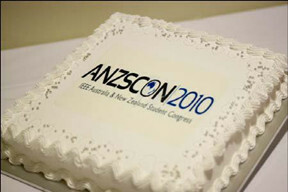 Overall, ANZSCON 2010 was deemed a great success. A detailed report is being prepared and will be presented to the IEEE Victorian Section Committee early next year. On present indications such an event is likely to run again in some form or other, at a location to be determined. My thanks to all my colleagues on the organising committee for their energy and commitment in bringing this pioneering event to fruition.